Q: We have noted that Foreign Minister Wang Yi was present at a summit on the Global Pact for the Environment at the UN headquarters in New York. As we all know, the Chinese government has been stepping up efforts for environmental protection. Will China become more proactive in its participation in global environmental governance? A: As you said, the Chinese government upholds the concept of innovative, coordinated, green, open and shared development, advocates the green, low-carbon, circular and sustainable mode of production and life, and has incorporated ecological improvement into the national development strategy. As a responsible major developing country, China has always been actively involved in the global environmental governance process. In his remarks at the Summit on the Global Pact for the Environment, Foreign Minister Wang Yi said that China supports the international community in strengthening dialogue and cooperation as part of the effort to cope with the issue of sustainable development, including environmental protection. The Chinese side stands ready to actively participate in the global environmental protection process, firmly support and implement the Paris Agreement and promote a fair, equitable, cooperative and win-win multilateral system for international environmental governance. We believe that in order to effectively advance cooperation on international environmental governance, we should take into account the interests of various parties comprehensively and remain committed to discussing environmental issues under the framework of sustainable development, upholding the principle of common but differentiated responsibility and national sovereignty over environmental resources, and the full participation of developing countries. The Chinese side will continue fulfilling its due international obligations, deeply engaging in international exchange and cooperation in the field of environmental protection and making new contributions to global ecological security. Q: UN Secretary-General Antonio Guterres came up with a goal to reform peacekeeping missions at a high-level Security Council meeting on UN peacekeeping operations yesterday. What's your comment on that? What China has borne in mind as it became more proactive in its engagement in UN peacekeeping missions in recent years ? A: On September 20, Foreign Minister Wang Yi attended the high-level Security Council meeting on UN peacekeeping operations at the UN headquarters in New York and expounded China's relevant stance, and the relevant readouts have been issued. I shall stress that the UN peacekeeping operations are an important means to uphold international peace and security. We support the UN peacekeeping operations in keeping up with the times, carrying out reasonable and necessary reform on the basis of extensive consensus among member states and continuing with development and innovation. As a permanent member of the Security Council, China has actively got involved in the UN peacekeeping operations and become the main troop and fund contributors for the peacekeeping operations, making remarkable contributions to the recovery of peace and stability of the relevant countries and regions and the protection of life and property security of local people. China has only one goal in the filed of peacekeeping, that is, fulfilling our due international obligations of and making contributions to safeguarding international peace and security. Two years ago, during his attendance at a series of UN summits marking the 70th anniversary of the founding of the UN, President Xi Jinping put foreard a series of major initiatives in support of improving and strengthening the UN peacekeeping operations, including establishing an 8,000-strong standby peacekeeping force and a permanent peacekeeping police squad, providing free military aid worthy of 100 million dollars to the African Union, so as to support the establishment of the African Standby Force and the African Capacity for Immediate Response to Crisis and deploy a helicopter squad for the UN peacekeeping mission in Africa. The Chinese government will continuously and actively support and increase its involvement in the UN peacekeeping operations, uphold the spirit of the UN Charter in practice and make our contributions to upholding the peace and security of Africa and beyond. Q: Firstly, US President Donald Trump has urged the UN Security Council to take strong and swift action to end violence against Myanmar's Rohingya Muslims. Does China agrees with him? Secondly, Spanish police have raided the Catalonia government offices to stop a banned independence referendum and arrested some Catalonia officials. How does China feel about the Spanish government's halting this vote on independence? A: As to your first question, the Chinese side is opposed to the recent violent attacks in the Rahkine state of Myanmar, and we understand and support the Myanmar government's efforts to uphold national stability. We hope the violence will subside soon and the innocent people no longer be harmed. I want to stress hereby that we hope the international community can play a constructive role in easing the situation and promoting dialogue. With regard to your second question, the issue of Catalonia is the internal affairs of Spain in essence, we believe the central government of Spain will be able to properly handle the relevant issue and maintain national unity, solidarity and prosperity. Q: First, at the UN yesterday, Japanese Prime Minister Shinzo Abe said that there was not much time left to take actions in response to the DPRK and he said that we consistently support the stance of the US that all options are on the table. What's China's comment on that? 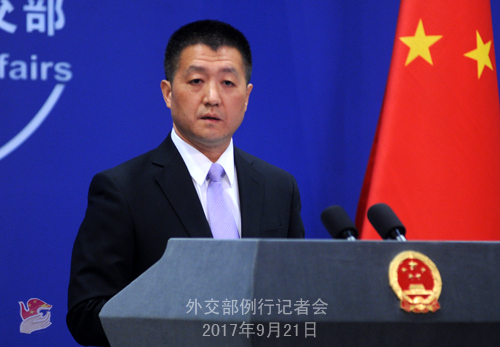 Second, what's China's comments on the outcome of yesterday's ministerial meeting on Iran's nuclear issue? What's China's stance on renegotiating and modifying the deal? France's President Macron said the deal could perhaps be expanded to ban missile test and cut the sunset clause which would allow Iran to resume some enrichment activity from 2025. Is that something that China will agree to? A: On your first question, in fact, as far as the Korean nuclear issue is concerned, we have stated our position recently time and again, and we have also stated our stance on the remarks concerning the Korean nuclear issue by relevant parties at the 72nd session of the UN General Assembly. I would like to underline again that the Chinese side stays committed to the goal of denuclearization of the Korean Peninsula and upholding the international nuclear non-proliferation regime. We still believe that it is necessary to uphold the peace and stability of the Korean Peninsula and that peacefully resolving the Korean nuclear issue through dialogue and negotiation is the only viable way out. You just mentioned the relevant remarks of the Japanese leader, and I have also noted there are some reports internationally. 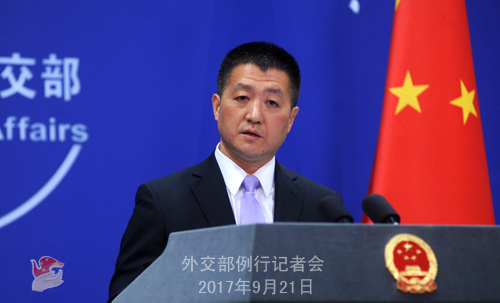 On the part of China, in terms of the useful experience that we can see in reality, whether it is the September 19 Joint Statement and the ensuing actual steps taken by the DPRK including the destruction of the relevant nuclear facility or the Joint Comprehensive Plan of Action on the Iranian nuclear issue, they are all tangible achievements of settling the issue of nuclear proliferation through dialogue. As to the thought of certain relevant parties that sanctions alone will ensure progress on the Korean nuclear issue, we have never seen any successful precedence of its kind in reality. As to the second question, Foreign Minister Wang Yi made clear China's position on and attitude towards the JCPOA at the meeting of foreign ministers of the six countries and Iran. We have issued a readout and I advice you to read it carefully. We have stated from this podium multiple times that the JOPOA is a successful model of peacefully resolving international hot-spot issue through dialogue and also a successful practice of multilateralism. 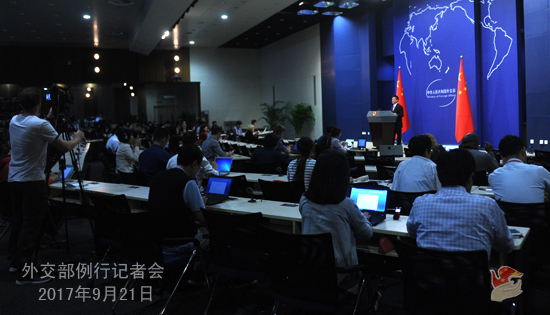 China supports the faithful implementation of the agreement by various parties. Foreign Minister Wang Yi also said at the meeting of foreign ministers yesterday that any agreement may not be perfect. As long as all parties still adhere to the principle and consensus embedded in the JCPOA and further discuss and better implement the goal of this agreement on this basis, we believe this will make a desirable way out.